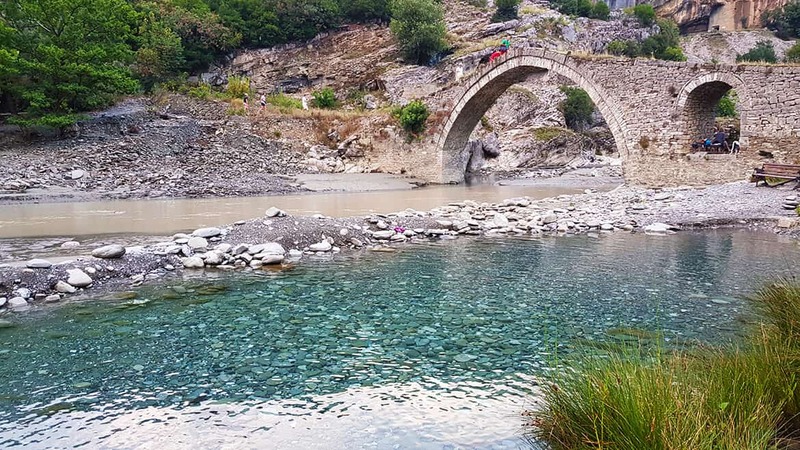 We spent 5 weeks in Albania and it wasn’t enough! I completely fell in love with Albania and the freedom I felt whilst traveling here. 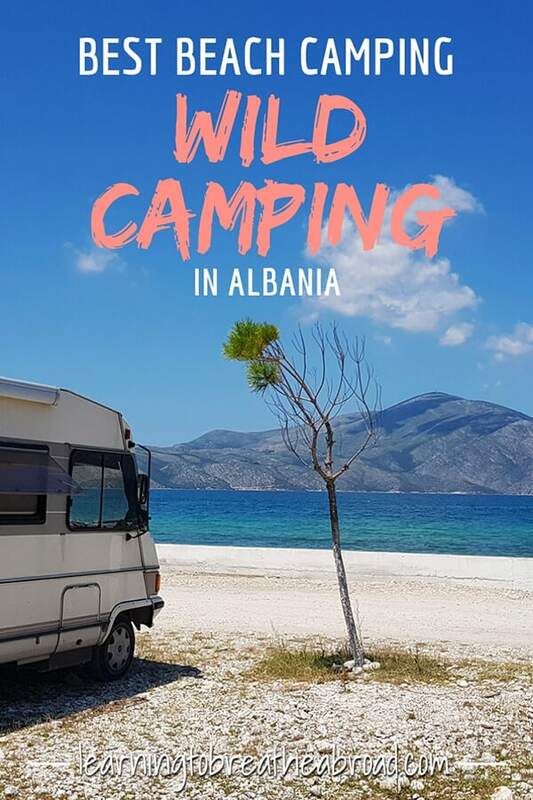 Free or Wild Camping is legal in Albania, which meant we could stop literally anywhere and spend the night, be that in the towns, on the beaches or anywhere else that took our fancy. And boy did we stay on the beach, like right on the sand, ON the beach. We’d wake up, pull our costumes on and five steps later we were in the most dazzlingly blue crystal clear sea. Albania has a really bad reputation as being full of mobsters and gangsters, but we felt safer here than anywhere we have traveled. In fact, it was the only country where we slept with the side windows of our campervan wide open without a worry. 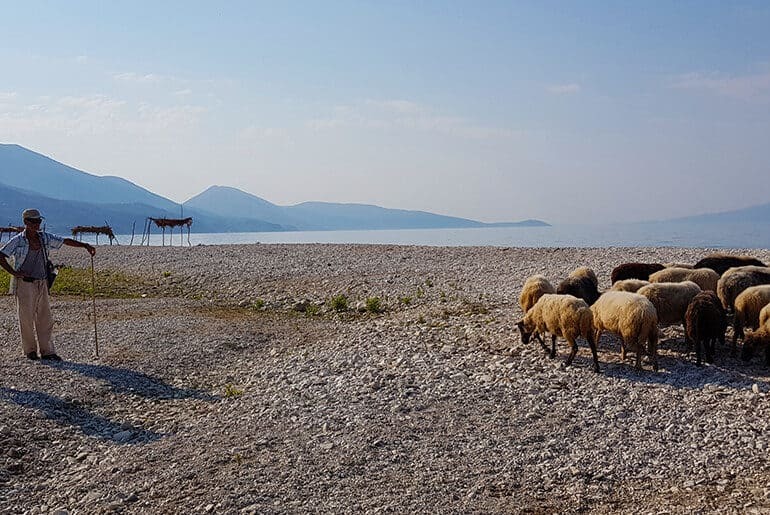 The people we met could not have been more hospitable, the food was amazing and beach or wild camping in Albania has to be my top recommendation for anyone traveling in the Balkans! We were in Albania for a month from mid-July to mid-August and then again for another 10 days at the beginning of September. 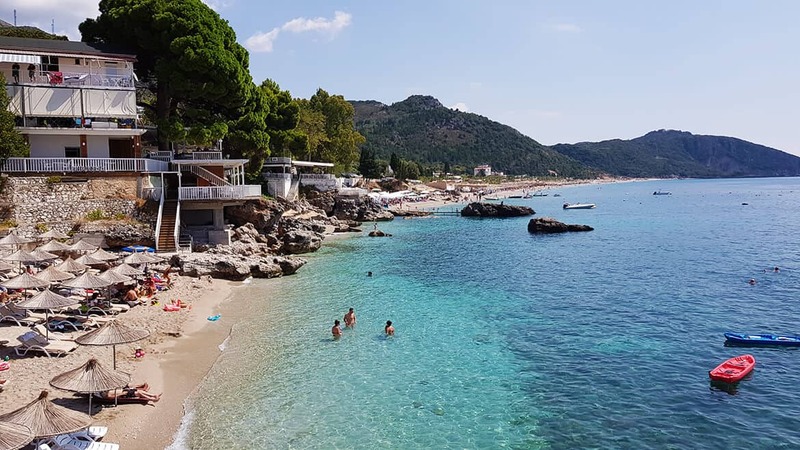 Despite being high season, the beaches were not packed, there was ample parking everywhere and definitely none of the crowds we’d experienced in Croatia and the coast of Montenegro. 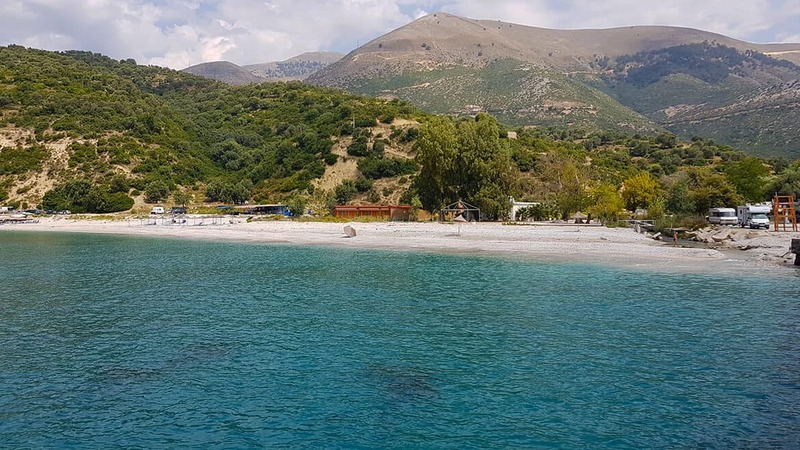 In my opinion, Albania’s beaches were the best in the Balkans with the added bonus of only costing €4 – €5 for two sunbeds and an umbrella! Season stops rather abruptly in the second week of September with beach restaurants closing and the mass removal of sunbeds and umbrellas. 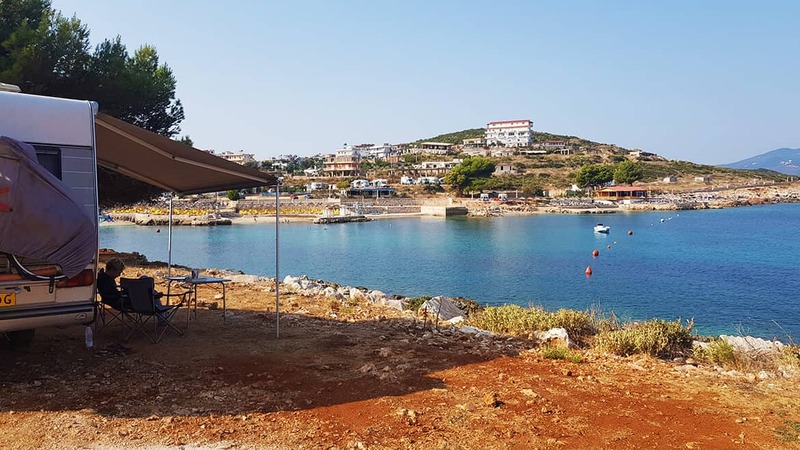 This is great if you’re wanting the beaches all to yourself, but for the remoter places, it will mean you’ll have to stock up on food as you won’t be able to grab a bite in a local restaurant. We stayed here twice, once on our way South and then again on the way back up to catch our ferry to Italy. This is a public parking right underneath the pine trees, which gave us lots of wonderful shade. Durres beach is the longest beach in Albania measuring in at about 10km in length. Just to the left of the above image, there is promenade that extends right into the centre of Durres. The promenade is lined with restaurants and huge hotels, so numerous places to connect to wifi while you grab a bite. At sunset the strip comes alive with hundreds of people going for their evening stroll, popup stalls sell everything from clothes to souvenirs, bumper cars entertain the kids and you’ll find an abundance of candy floss and ice creams. Despite the hive of activity close by, the parking area was quiet and we had peaceful evenings. Shops & Restaurants: There is a supermarket one road back and lots of restaurants to chose from. Miami Restaurant was super cheap and good food. Toilets & Showers: There were showers on the beach but none were working when we were there. Toilets are available in nearby restaurants and hotels. 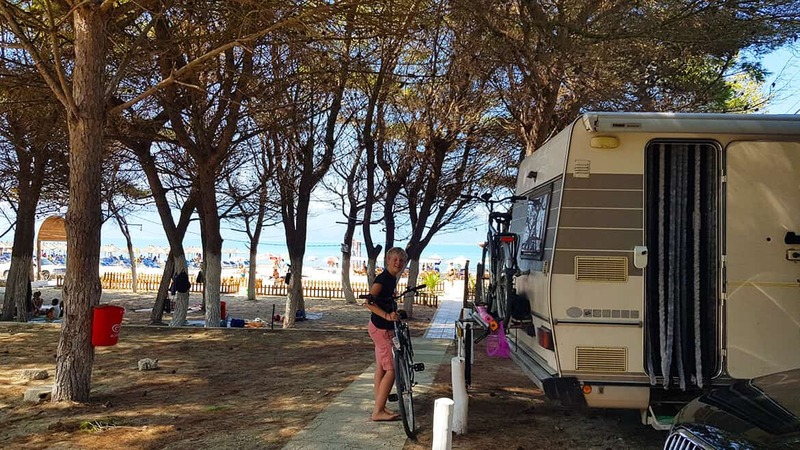 Wifi: If you park close enough to the restaurants, you can connect from in the campervan or pay for a sunbed and get connected to the beach wifi. There were lots of places to park almost on the beach, but we chose to park behind the Bar Restorant Tafili as it was in the shade of pine trees and it was more secure. It also meant we were close enough to connect to the restaurant’s wifi – had it been working at the time! The owners were wonderfully helpful and they made a killer dish of calamari! If you’re up for some action, the volleyball court is busy every afternoon and they’re always looking for players. 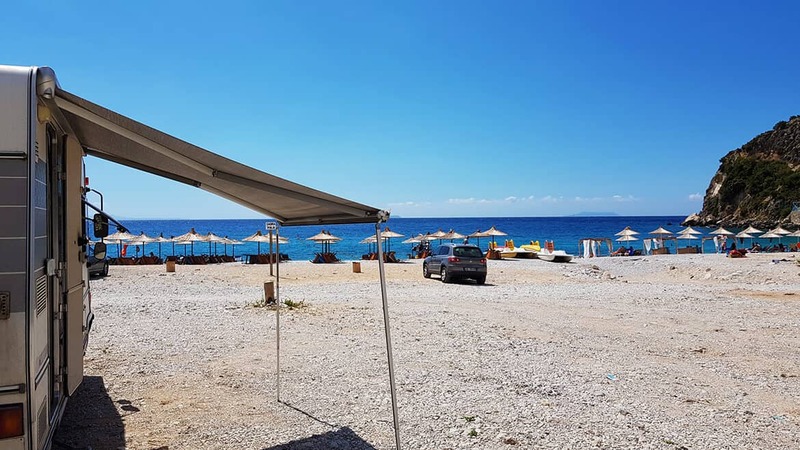 Shops & Restaurants: There are no shops nearby but there are a couple of beach restaurants and bars along the beach, but these will only be open from June to August. Toilets & Showers: There are beach showers and the restaurant has a toilet. Wifi: If you park close enough to any of the restaurants you can get wifi in your campervan and the restaurants are happy to give you the password. 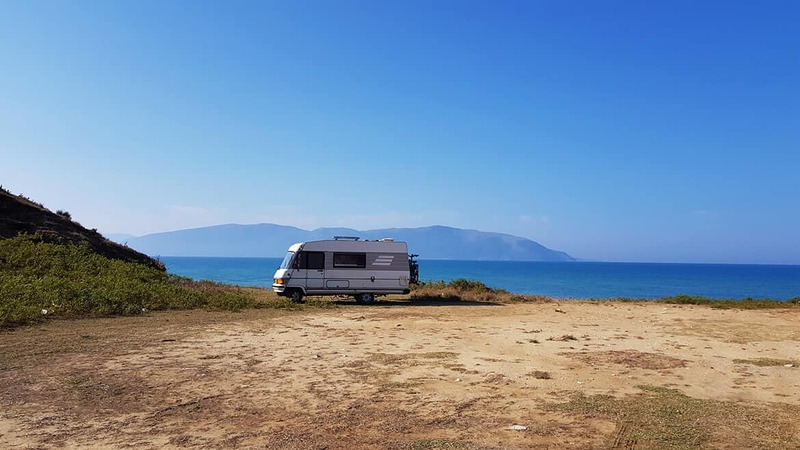 On a narrow strip of land between the sea and the Narte Lagoon, sits this flat patch of land that is just perfect for wild camping. With heavenly views out over the sea and a huge flock of flamingos continuously flying overhead, this place is a slice of heaven. It is as remote as it gets and does require that you drive a rather rough dirt track to get there, but it is oh so worth it. There is absolutely nothing around and you’ll probably not see any other people while you’re there, but that’s what makes it so special. The Narte Lagoon is teeming with birds so make sure you have your binoculars. Wifi: You will be blissfully disconnected from the world – unless you have a SIM card! Orikum has a long road stretching the length of the seafront. 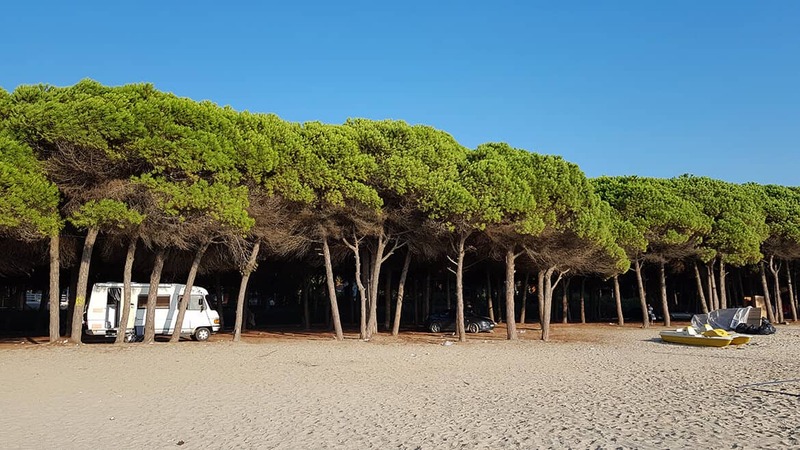 The southern strip is quite developed and is lined with restaurants, beach bars and cafes, while the northern part has wide open fields and only 2 or 3 restaurants, so ample place to park a campervan. There were even people camping in tents while we were there. We choose to park next to a restaurant so we could get wifi in the van. They were very accommodating, letting us use their hose and wifi in return for a cup of coffee and the odd meal. The Hotel Alba Gert next door has a fabulous restaurant, Restorant Peshku Shpendi, where you can get a huge bowl of mussels and a beer for 800Lek. The beaches have pebbles but the sun loungers along this part were for free. Shops & Restaurants: Lots of restaurants around and the town of Orikum is a 2-minute drive away and has great supermarkets, bakeries and patisseries. Toilets & Showers: The restaurant had a hose which we used to shower under and toilets in the restaurant. Wifi: All the restaurants had wifi and Hotel Alba Gert didn’t even need a password. Dhermi, stunning, heavenly Dhermi! The whole beachfront is being revamped into a pedestrianised promenade so there is very little parking available for campervans. We parked behind the beach restaurants on a flat piece of land owned by one of the hotels. We were asked to pay 500 Lek for the night, which we didn’t mind at all seeing as this was literally the only place we could find to stop. There was a tricky path leading from the parking to the main beach. I don’t think it is possible to get more on the beach than here at Livahdi Beach. We could have parked even closer but wanted a little more privacy. If you arrive in high season try and get here early in the morning or late in the evening in order to get a parking space. The first time we arrived midday and this parking area was full, so we parked further along the road (see the second GPS coords). This has to be one of the most beautiful beaches in Albania with its white pebbles and crystal clear water. There are lots of great restaurants along the beachfront and ample sunbeds to choose from. Shops & Restaurants: There is a little supermarket and about 20 restaurants to choose from. Wifi: There were lots of strong wifi signals in the campervan but we couldn’t get the right passwords. The restaurants were very happy to let us sit and work for hours though. 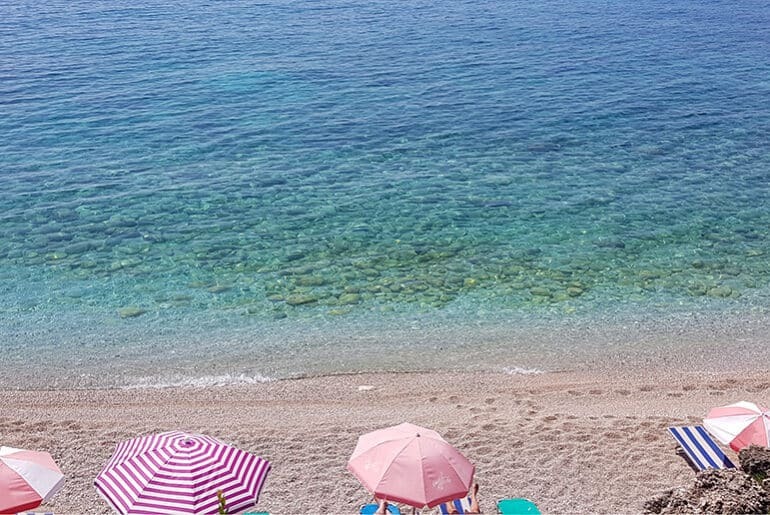 Borsch Beach is, without doubt, our most favourite place in Albania. A vast stretch of beach with nothing other than the odd other campervan. There is one restaurant about 10 minutes walk away, right in front of the police station. 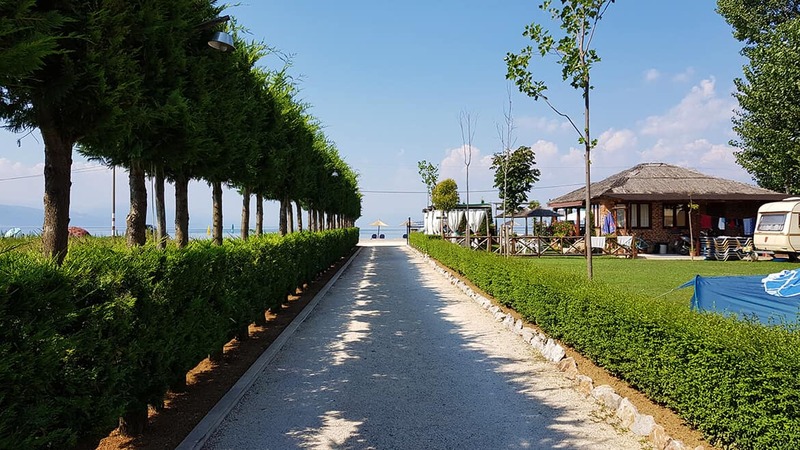 Having a bicycle here is an absolute win as you can then ride the 2kms to the beach supermarket or fetch burek fresh out the oven each morning at the local cafe. There are lots of restaurants and lively beach bars further up the strip near the supermarket, but the restaurant close by serves delicious cheap food so highly recommended. Besides being stunningly beautiful beach and having blue blue water, there is also a river that runs down into the sea. This is fabulous fresh water so after a day of beach and sun, you can have a quick dip in the stream to cool down and get rid of the salt. We also made a rock pool to store our drinks in the water to keep them cold. Cows, pigs, goats and sheep come by with their tinkling bells, as does a man selling fresh fish and one selling fresh figs. We came back here three times for 3 nights each time. 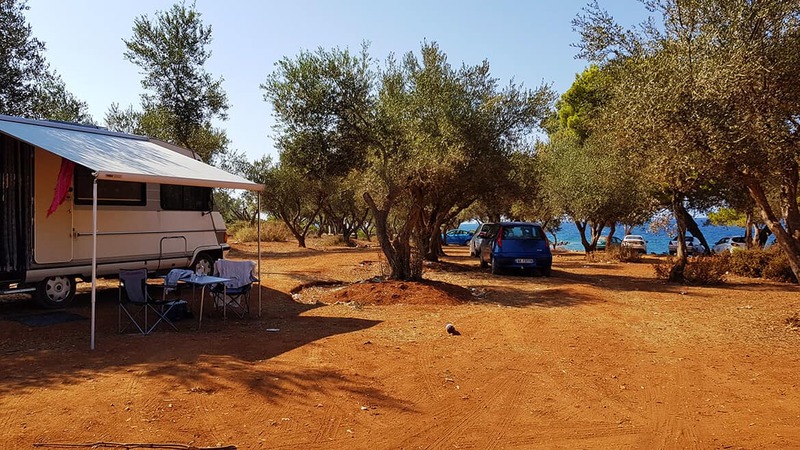 The first time, we parked along the road parallel to the beach, but we hit a win on our next two times and managed to get the most awesome spot right next to the freshwater stream. It is a little set back from the beach but it is definitely the best place to park. Just beware that the pebbles on the beach have ensnared many a campervan so unless you have 4WD, don’t park too close to the sea. Shops & Restaurants: One restaurant close by. Shops and more restaurants 2km away. Toilets & Showers: Nothing close by. Shower in the stream. There is a beach shower and a toilet at the beach restaurant. A beautiful beach with a jetty stretching out into the sea. Perfect for jumping into the water or for testing your fishing skills. There is also a freshwater stream for rinsing off the salt at the end of the day. There is a hotel with a restaurant, but nothing else around. Shops & Restaurants: There are no shops anywhere near. The hotel has a restaurant. Toilets & Showers: Toilets are available in the hotel, but no showers. Wifi: The hotel had wifi. The first place we stayed was just on the outskirts of Ksamil town, overlooking the bay with Corfu in front of us. There was a fabulous little beach to the left. I’m not sure how long this space will be available to wild camp as a new beach bar was busy being built close by. It was very peaceful and quiet at night. Shops & Restaurants: There was a selection of great restaurants about a 3minute walk away, with the supermarket a good 15 minute walk away. Toilets & Showers: There were showers and toilets and the nightclub next door. Wifi: There was strong wifi from hotels, restaurants and the nightclub nearby, so we had our pick of wifi options. This site had lots of flat places to park with a pebble beach right in front or a sandy beach (Puerto Rico beach) just before this spot. The views are fabulous, but sadly there was lots of refuse lying around. None of the restaurants close by where open when we were there, so either you’ll have to walk back into town or come prepared to cook. This was a very noisy spot as the beach bars opposite the bay played loud thumping music non-stop. Shops & Restaurants: There was a beach bar that looked like it could possibly serve food, but it was closed when we were there. No shops within walking distance. There is lots of place to camp right on the river at the entrance to the Langarica Canyon. Walk across the old bridge or through the river to the hot spring pools where you can cover your face and body with mineral-rich mud and have a completely natural spa day. If your nose stars crinkling with unpleasant odours, it is merely the sulfur from the springs that you are smelling. Note that it gets ridiculously busy here from 9am onwards, so it is best to arrive early evening in order to find a place to park. There is a nominal fee of €1.50 to be paid for the overnight parking. Shops & Restaurants: Nothing around for miles! Some locals were selling roasted corn on the cob. Toilets & Showers: Nothing around for miles! Wifi: Nothing around for miles! Even the mobile signal was terrible here. 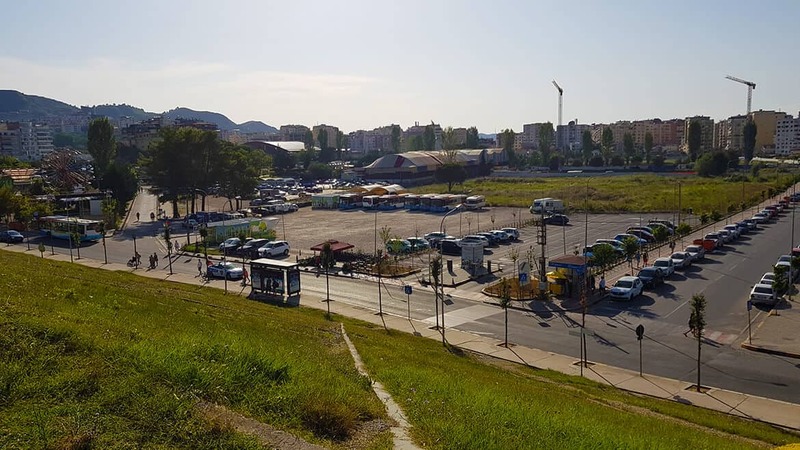 Although not very pretty to look at, I wanted to include this spot as it was so perfectly situated for a visit to Tirana. We camped in the big parking lot, right next to the lake and the big park and it is super close to the city centre. If you have bicycles then even better as Tirana has huge wide roads with great bicycle lanes. There was electric hookup and toilets available and the free wifi was excellent. The cost was 1000 Lek for 24 hours. Shops & Restaurants: A couple of options within 10 minutes walk. We did’t see a supermarket close by, but that doesn’t mean that there wasn’t one. Lake Shkodra Resort was like bubble of heaven in the Balkans. Pristine facilities, a gorgeous lake to swim in, an excellent restaurant, happy staff, flat and shaded pitches. Just amazing in every way! 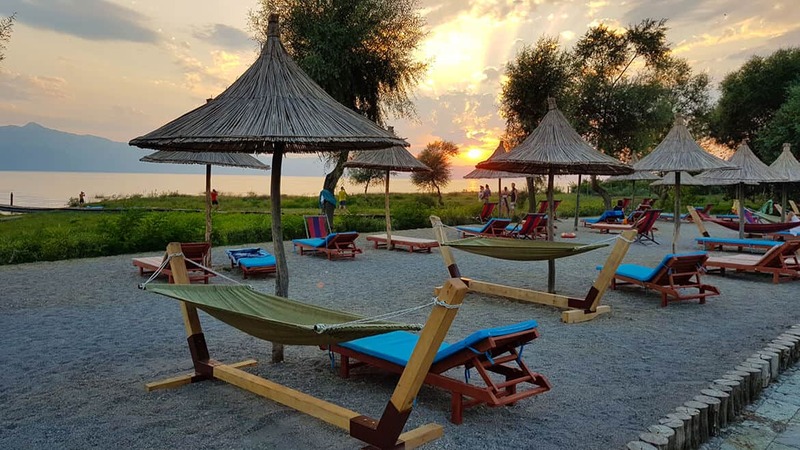 All facilities were available and they also offered tours to Thethi, Lake Komani and Shkodra. 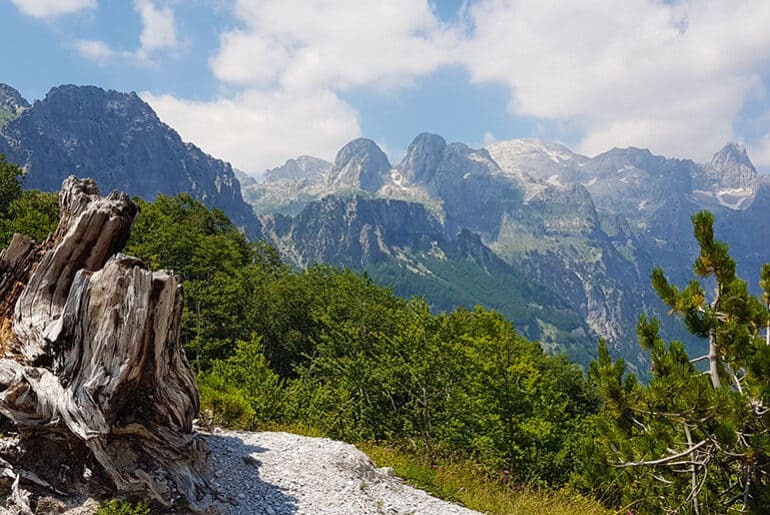 We booked our Valbone to Thethi hike with them, which was one of the highlights of our trip. 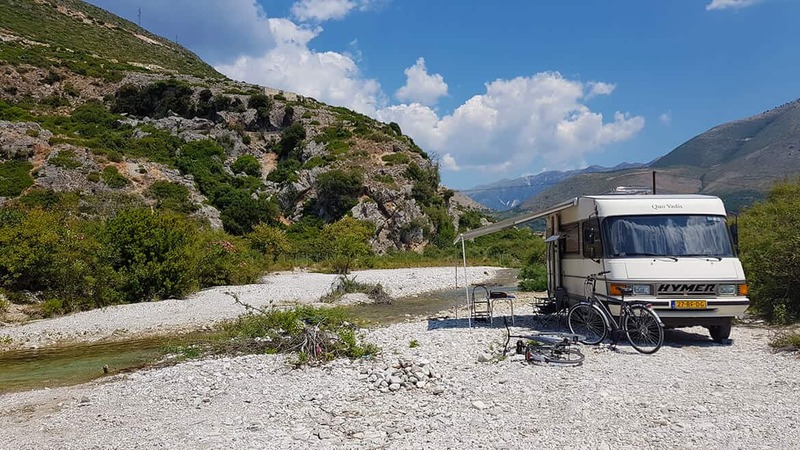 The campsite was only a few kilometers outside the town of Shkodra, so perfect for a bicycle ride into town. The campsite restaurant had some of the best food we ate in all our time in Albania. Make sure to try the local Albanian vegetarian platter or trout fresh from Lake Shkodra. Toilets & Showers: Everything you could wish for! 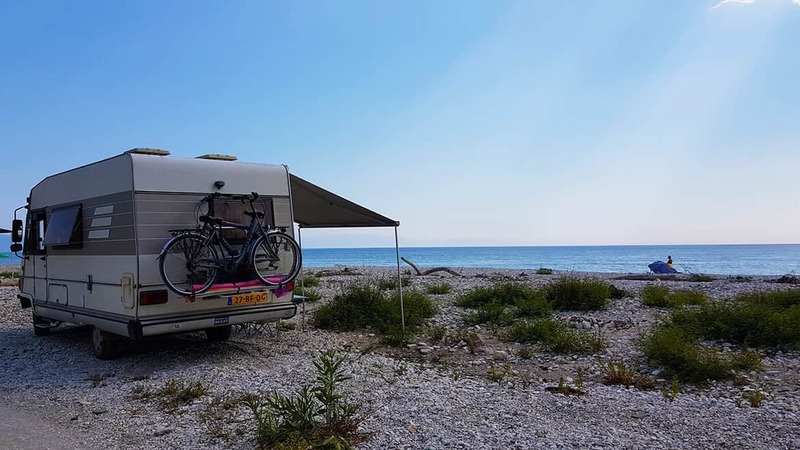 Located right on Lake Ohrid, this small campsite has place for 20 campervans. There is a restaurant on site and the sun loungers on the beach are for free. Full facilities including washing machines for 2 Euro. Cost per night is 15 Euros. Shops & Restaurants: Restaurant on site and a few other options within walking distance. The closest supermarket was a few minutes drive away. Wifi: The campsite has wifi, but the closer you park to the restaurant, the stronger it is. 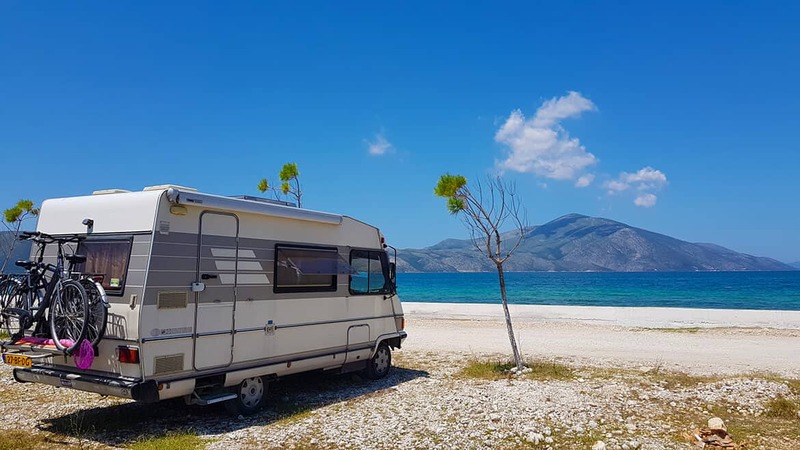 Have you traveled by campervan through Albania? Do you have any great camping spots to add to this list? I’d love to hear!